← The Giant’s Shoulders #22 is up! I swear that I’m not going through journals looking for old versions of the Mythbusters‘ experiments! After blogging about old scientific papers on myths such as “finger in the barrel” and “Archimedes death ray“, I figured I’d pretty much tapped out historical mythbustin’ papers. Scientists of every era, however, have an eye for the weird, so I suppose it was inevitable that I found another paper with a connection to modern mythbusting! 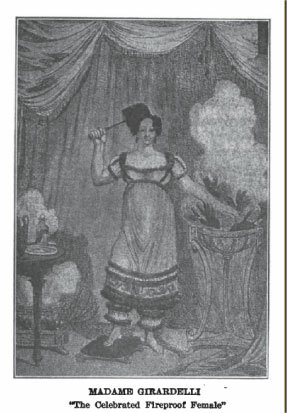 The paper in question is “Memoir on the Incombustible Man; or the pretended phænomenon of incombustibility,” from volume 32 of the Philosophical Magazine from 1808, by Louis Sementini, M.D., chief Professor of Chemistry in the Royal University of Naples. Paris has for some days rung with relations of the wonderful exploits of a Spaniard in that city, who is endowed with qualities by which he resists the action of very high degrees of heat, as well as the influence of the strong chemical re-agents. Many histories of the trials to which he has been submitted before a commission of the Institute and Medical School, have appeared in the public papers; but the public wait with impatience for the report to be made in the name of the commission by Professor Pinel. The subject of these trials is a young man, a native of Toledo in Spain, 23 years of age, and free of any apparent peculiarities which can announce any thing remarkable in the organization of the skin; after examination, one would be rather disposed to conclude a peculiar softness than that any hardness or thickness of the cuticle existed, either naturally or from mechanical causes. Nor was there any circumstance to indicate that the person had been previously rubbed with any matter capable of resisting the operation of the agents with which he was brought in contact. This man bathed for the space of six minutes, and without any injury either to his sensibility or the surface of the skin, his legs in oil, heated at 97° of Reaumur, (250¼ degrees of Fahrenheit;) and with the same oil, at the same degree of heat, he washed his face and superior extremities. He held for the same space of time, and with as little inconvenience, his legs in a solution of muriate of soda, heated to 102 of the same scale, (261½ Fahr.) He stood on and rubbed the soles of his feet with a bar of iron heated to a white heat; in this state he held the iron in his hands and rubbed the surface of his tongue. He gargled his mouth with concentrated sulphuric and nitric acids, without the smallest injury or discoloration; the nitrous acid changed the cuticle to a yellow colour; with the acids in this state he rubbed his hands and arms. All these experiments were continued long enough to prove their inefficiency to produce any impression. It is said on unquestionable authority, that he remained a considerable time in an oven heated to 65 or 70°, (178–189 Fahr.) and from which he was with difficulty induced to retire, so comfortable did he feel that high temperature. It may be proper to remark, that this man seems totally uninfluenced by any motive to mislead, and, it is said, he has refused flattering offers from some religious sectaries of turning to emolument his singular qualities; yet on the whole it seems to be the opinion of most philosophical men, that this person must possess some matter which counteracts the operation of these agents. To suppose that nature has organized him differently, would be unphilosophic: by habit he might have blunted his sensibility against those impressions that create pain under ordinary circumstances; but how to explain the power by which he resists the action of those agents which are known to have the strongest affinity for animal matter, is a circumstance difficult to comprehend. It has not failed however to excite the wonder of the ignorant, and the inquiry of the learned at Paris. 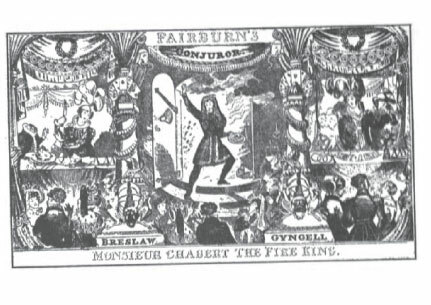 It perhaps seems remarkable that people, even in that late era, could be taken in by the theatrical tricks of “fire eaters”. The reality, however, is that the phenomenon of heat was poorly understood in the early 1800s, the consensus belief being that heat was a material, conserved “fluid” referred to as caloric. Though the kinetic theory of gases (and the idea that heat results from the motion of particles) had been postulated much earlier (1738) by Daniel Bernoulli, it seems that the caloric theory had the most attention until sometime into the 1800s. With this absence of a real understanding of heat, it is not surprising that people could view performers like Señor Lionetto as being somewhat legitimate wonder-workers. The arrival of a man calling himself incombustible, who treated hot iron in various manners, drank boiling oil, and handled liquid lead, &c., was scarcely announced, when this interesting phenomenon engaged me so much, that I left no means untried by which I might be enabled to form an opinion of it. First, it was indispensably necessary to ascertain the fact, by assisting assiduously at the experiments which Señor Lionetto, otherwise called the incombustible man, presented to the public. I approached as near to him as possible, that I might observe minutely whatever was most particular in his experiments — of which the following is an account. Señor Lionetto commenced the proof of his incombustibility by putting over his head a thin plate of red-hot iron, which, at least in appearance, did not alter his hair. The iron had scarcely come in contact with it, when a considerable quantity of dense white vapour was seen to arise. A second plate of red-hot iron was likewise passed over the whole extent of his arm and leg. With another red-hot iron he struck his heel and the point of the foot repeatedly: in this experiment the contact of the fire was longer than in any of the preceding. From the sole of the foot so much vapour was disengaged, that being very near the experimenter, my eyes and nose were sensibly affected. He also put between his teeth a heated iron, which, although not red-hot, was still capable of burning. It was announced that he had drunk half a glass of boiling oil; but, in fact, I found that he had never drunk such a dose, and that he had performed this twice by introducing a little into his mouth, not more than the third part of a spoonful, at a time. It was likewise said that he had washed his hands and face in boiling lead; but he now practised such an experiment only in rapidly bathing the extremities of his fingers in liquid lead, and also carrying a very small portion of it on his tongue. Emphasis mine! The ability to dip one’s hands in molten lead without injury is precisely the myth “lead plunge” that the Mythbusters tested in their 2009 episode, “mini myth mayhem“! We’ll return to the Mythbusters’ take on the myth later; for now we consider Sementini’s investigations. The experiment with which Señor Lionetto is accustomed to terminate his exhibition, is that of passing through the skin of his arm a thick gold pin, which he does without feeling the least pain. In this proof of his insensibility, I observed that the pin entered his skin with difficulty, requiring such a force as if it had to perforate dressed leather. Now although at first view this fact seemed to have no relation with the others practised by means of fire, yet it appeared to me to throw some light on the examination of the phænomena relating to the pretended incombustibility. From these experiments, which I have seen so often repeated, I fancied that Señor Lionetto’s skin had become so insensible, from the effect of repeated frictions with some substances fit to produce such a change, by stimulating excessively the nerves and the vessels of the skin, and by recent usage, that it was capable of impeding in a certain degree the free passage of caloric. Besides the action of such substances, I thought that the force of habit must always have added to such a disposition, and that even the frequent impression of the fire should have contributed not a little to produce such insensibility in his skin: the experiment of the pin which he put through it, was to me no light argument of its hebetude. Instead therefore of uselessly wasting time in simple conjectures, I resolved to adopt the best experimental art which I knew, trying on myself the action of all the means proper to benumb the cutaneous nerves, and to clothe the skin with a substance which was a nonconductor of caloric. Few substances belonging to chemical compositions, or to other natural bodies, appeared to me proper for the purpose which I had in view. The sharp sensation which was excited by the vapour disengaged by the contact of the fire with the incombustible membrane, and the chemical reason, induced me first to have recourse to acid substances, and to some of the acidulous salts. It would be too tedious to relate in detail all the various substances and experiments which I made: with some of them I attempted to rub my skin, which, after the liquids dried, was always sensible in the same degree to the action of the fire. The unfortunate result of my first experiments did not discourage me; persuaded that by the effect of only one rubbing, it was not possible to change the skin in such a manner as to render it insensible to the action of fire. I therefore repeated oftener on the same part the frictions with the same substance, and perceived the effect, that it gradually became less and less sensible to the action of caloric. On one part of my body I repeated the frictions so often with dilute (allungato) sulphurous acid, that I was finally able to pass a plate of red-hot iron over it without any injury. I afterwards discovered that dilute sulphuric, nitric, and muriatic acids would equally produce the same effect: but the sulphurous acid is preferable to all the others, as it produces the speediest and most certain effect. These essays, however, were only the rudiments of a knowledge of the phænomenon, the examination of which was still incomplete. An accidental combination afterwards induced me to undertake a new series of experiments, by which I might be enabled to give a more clear explanation of all the more difficult operations executed by Lionetto. Wishing to examine if washing the almost incombustible part would make it lose the quality it had acquired, I rubbed it with hard soap, washed and dried it with a cloth, and applied the same plate of red-hot iron. I then discovered, to my surprise, that the skin of that part not only preserved the same insensibility to the action of red-hot iron, but had even become stronger than at first. I again rubbed the same part with soap without wiping it with the cloth, and passed over it the iron very red-hot, without feeling any painful sensation, or even having the hair burned. Remembering the crust which I observed on Lionetto’s tongue, I determined to rub mine with the same soap; in consequence of which it became equally insensible to the action of fire. It will not now be improper to show practically what method should be adopted by any person wishing to become in this sense incombustible. Professor Sementini was convinced that all of Lionetto’s tricks were the result of careful and secretive preparation. It seems, however, that he was guilty of overthinking the problem: though many of the tricks likely required a certain amount of chemical treatment and training, through the use of simple physical principles one can demonstrate a seemingly magical amount of “incombustibility”. “All wonder,” said Samuel Johnson, “is the effect of novelty on ignorance.” Yet we are so created that without something to wonder at we should find life scarcely worth living. That fact does not make ignorance bliss, or make it “folly to be wise.” For the wisest man never gets beyond the reach of novelty, nor can ever make it his boast that there is nothing he is ignorant of; on the contrary, the wiser he becomes the more clearly he sees how much there is of which he remains in ignorance. The more he knows, the more he will find to wonder at. 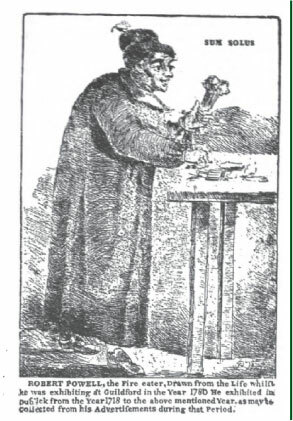 It is extraordinary, that in examining all the phænomena which Señor Lionetto has exhibited to the public, no one has mentioned the most extraordinary of them, his proposal to enter an overn, (I know not at what degree of Reaumur’s thermometer,) with a piece of raw mutton in one hand and an egg in the other, &c. But, if the phænomenon does not exist, what reproach should I not merit for having hazarded an examination of an imaginary fact? … I can venture to assure any person whatever, that Lionetto never entered an oven, nor will he enter one near us: this I shall repeat till the very moment in which myself and others may see him inter it; so well persuaded am I that he cannot realize his proposal, if the oven has no particular construction which alters its nature and effects. Explanation: On entering the cage the performer places the steak on a large iron hook which is fastened in one of the upper corners. The dress worn is of asbestos cloth with a hood that completely covers the head and neck. There is a small hole over the mouth through which he breathes. As soon as the fire starts the smoke and flames completely hide the performer from the spectators, and he immediately lies down on the bottom of the cage, placing the mounth over one of the small air holes in the floor of the same. Heat always goes up and will soon cook the steak. Though additional “tricks” are used, the crux of the performance is simply the fact that the top of the oven heats up much more rapidly than the bottom! What may be the accuracy of the experiments detailed in the last Number of your Magazine, by Dr. Sementini, relating to the incombustible man, I know not; but of this I am certain, that the Doctor has gone sadly out of his way to account for the method employed by Señor Lionetto, to render his tongue uninjured by the hot iron which he was accustomed to pass over it. The fact is, that there is not the slightest occasion to defend the tongue with alum, sugar, soap, or any other substance, for the purpose of rendering it insensible to the action of the red-hot iron. I have repeatedly seen a friend of mine pass over his tongue, without any covering, a red-hot poker; and this experiment, which he has performed hundreds of times, to the great astonishment of dinner and tea parties where he happened to be, I ventured (on his assurance that no hurt would ensue) to repeat… It is only necessary that the tongue be wet with saliva before it is put out of the mouth, and that the poker be of course quickly passed over it. The cause of this phænomenon I conceive to be, that the saliva is vaporized, and in fact prevents the iron from ever actually touching the cuticle. A person can dip their hand without injury into sufficiently hot molten lead, provided their hand already has sweat or water upon it which will form the protective steam layer. In addition to what has been stated above by W.S., I shall have mention a circumstance which occurred since the publication of Dr. Sementini’s paper. Having mentioned to a plumber, whom I had employed to repair a lead cistern, some of the particulars of the incombustible man, he expressed but little surprise. Any one, he said, might draw their finger through melted lead, if they did it somewhat quickly; and having in his hand a ladle full of melted solder, he instantly passed his finger through it. He said he had often passed a red-hot piece of iron over his tongue, and seen others do it without injury. In the first experiment, he said, it was necessary that the finger should be perfectly dry — if otherwise, the person might get what he called a thimble, i.e. some of the metal would stick to the finger and give a severe burn… It seems somewhat analogous to what takes place with a drop of water let fall on a plate of red-hot iron, which takes a much longer time to evaporate than a similar drop let fall on hot iron which would hardly shine in the dark. It is somewhat fascinating to note that we have here a phenomenon which was commonly known to exist to a certain class of workers but relatively unknown in science! It is reminiscent of the history of the giant squid, which was known to mariners from ancient times but widely unrecognized in the scientific community until the 1850s. One thing is somewhat troubling about Tilloch’s description above. Tilloch’s friend insists that it is safest to have one’s hand perfectly dry in order to avoid metal sticking to it, but the Mythbusters deliberately dipped their hands in water to enhance the Leidenfrost effect! I came up with two possible explanations for this discrepancy. First, the lead workers of Tilloch’s time may have been using a much lower temperature of molten lead — in such a case, additional water on the hand might cool the lead enough to stick. Second, and more speculative, the lead workers may simply not have had very clean hands, and water could have increased the likelihood of metal sticking to crusted dirt! I shall here state another fact, which may, perhaps, but not quite so satisfactorily, be explained on similar principles. A gentleman informs me that he has seen an iron founder skim melted iron with his hand. The founder stated that he could only do it when the iron was boiling hot: — if of a lower heat, it would burn him. * At least, I have a topic odd enough to compete with Scicurious’ Weird Science Fridays! 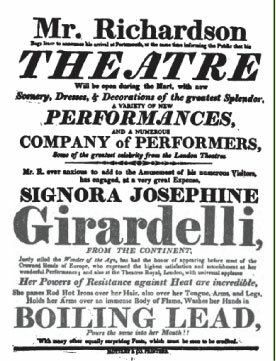 ** Accounts differ as to whether Sementini observed Lionetto perform in Paris or in Naples. An 1806 description in The Port Folio magazine, however, describes Lionetto as still in Paris, and suggests that he had an extended stay in that city. *** Houdini’s book was the first place I found reference to a popular article on Lionetto. This entry was posted in ... the Hell?, General science, History of science. Bookmark the permalink. I think you ought to get a second doctorate for this post! Interestingly its the first actual reference to Réaumur’s temperature scale that I’ve ever seen. I hadn’t thought about the reference to Réaumur’s temperature scale, though it seems to have been used in a number of the reports on heat resistance; I’ll have to snoop around more about it. The Minard Map, showing what happens when you invade Russia in the winter, uses the Réaumur scale. Ah, but I’m an American as well — I do science in Kelvin, but I freeze/melt on a Fahrenheit scale! The Réaumur scale shows up in your standard Russian Lit curriculum. I remember Dostoyevsky giving the temperature in degrees Réaumur in Crime and Punishment, when I had to read it in high school (though at the time, I think I took it as an alternate spelling of the Rømer scale, which it isn’t). Nabokov uses it here and there, too. M. Homais quotes temperatures in Celsius and Réaumur in Madame Bovary (and screws up the conversion to Fahrenheit, because he’s really a moron). “Revelations of a Spiritual Medium” (1891) gives a formula to avoid heat damage on hands (and with a further ingredient added, to walk on red hot iron bars) on p. 99 and discusses a female American medium who claimed to be fire proof while she was ‘controled’ by an ancient sun worshiper. Yikes! Walking on red hot iron, even if possible, sounds much too freaky for my tastes (and I jump out of airplanes for fun). BTW, thanks for single-handedly destroying my productivity with that link!